We were lucky to get a long weekend recently and, despite stormy weather and floods, decided to visit New England region (550 km to the North from Sydney). Beautiful Celtic place made by residents of Glenn Innes (official information is here, and more photos are here), every stone symbolizes something – can be place, history or astronomical event. 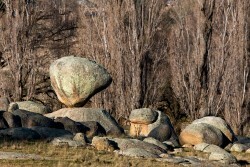 Driving along the New England Highway we couldn’t miss the Balancing Rock, located on someones private farm land. Next day, as planned, we went to Waterfalls Way to see Ebor, Dangar and Wolomombi Falls … there are more of them but we choose these three as more promising. 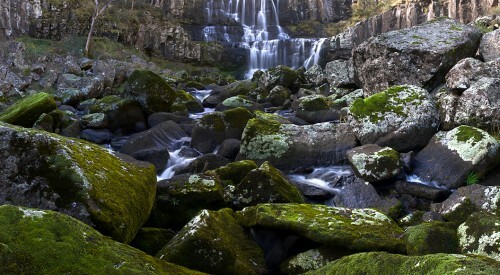 Dangar, Wolomobo falls and some other shots are here. Fog and late autumn gave us a good chance to experience real autumn weather (which we haven’t seen for more than a 3 years) on the way back. We have definitely missed the best time to see it (a month earlier would be great) , but still better than always green eucalyptus. 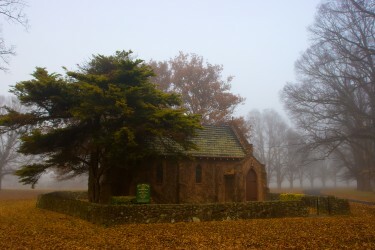 This place is famous by it’s Gostwyck Chapel, but, unfortunately, we were late to see it in it’s full color.